At first glance, fly-fishing lines seem simple as can be. Look at the handle of your rod. It says “6”. That means you need a 6-weight fly line. Buy one, and you’re done, right? If only it was that simple. Unfortunately, the popularity of fly fishing and the proliferation of fly equipment has lead to many specialized fly lines, some of which are great for any application, some which are niche, and some that are almost useless for day-to-day angling. Let's take a look at the primary differences between different fly lines, what they’re used for, and what you should be looking for if you’re in the market for a new line. Line weight is one of the best ways to determine the correct line for your rod – but it’s not the whole story, and it’s not a hard-and-fast rule. Your rod won’t snap in half if you load it with a line that’s 1wt heavier than recommended, nor will the line float in the air if you load it up with a slightly lighter line. In fact, adjusting your line weight depending on the situation can be quite useful – for instance, using a slightly lighter line if you’re fishing in an area where the water is calm, and you would otherwise need to use a longer leader, which could decrease your accuracy and castability. In these cases, a lighter line means you can use a shorter leader because it won’t develop as much speed, and it won’t land as “heavy” on the water, leading to a more calm and collected impact that won’t frighten fish. A heavier line can also be useful – particularly in close-quarter areas where you aren’t casting more than 20-30 feet and your line won’t load up and flex your rod correctly, due to most of the distance being taken up by your leader, with only a few feet of your actual line outside the rod tip. A heavier line allows for greater flex and load even when you haven’t cast as much line out, because the heavier weight helps to make up for the lack of line that’s fed out in these close-quarters situations. Now, even though these situations are niche, they serve to illustrate that, despite what manufacturers say, most fly rods can be used with lines that are 1-2 weights heavier or lighter than they are designed to use – this is especially true for fly rods, because the lines manufactured for them are often heavier than advertised by 0.5-1 weight. This is because of the newer technologies that are built into these lines – tapered ends, heavier tips, and other technologies that generally aren’t taken into consideration when rating them, due to the fact that the original 1962 AFFTA standards have not been updated to include them. This is the most popular and versatile type of line – this line has the bulk of its weight concentrated in the front 30’ of line – it’s thicker and heavier near the tip, and then tapers again to allow easy leader attachment. The rest of the line is a consistent thickness, called the “running” line. These lines are the most popular by far, allowing distant, easy casts, and make up the bulk of fly lines. Level lines are just as they sound – no taper, no extra weight, a thoroughly even design throughout. Budget lines are often level, as they offer no advantage over any other kind of line, and are usually cheaper. They’re not necessarily bad, but they don’t offer anything that’s not better done by a double-taper or weight forward line. Floating fly lines do just that – they float. They are extremely versatile, and by far the most popular for everyday fly fishing situations, and available both in forward taper and double-taper configurations. Sinking lines are more common in weight-forward variations. They come in several different ratings, corresponding to how quickly they sink in the water, which can be useful when fishing to a specific depth. Sinking tips are a sort of combination between the two above variations – the tip of the line, usually about 8’ - 16’ in length, is designed to sink, while the rest of the line floats. These have an advantage because they’re much easier to reel in than sinking lines – you don’t have to pull the entire line through the water, which takes considerable pulling power – only the tip sinks, so it’s much easier to cast and retrieve repeatedly. The above 3 line styles and sinking/floating styles can be combined in many ways, and there are more specialized styles out there. However, almost all popular fly line is available in a single configuration – Floating, Weight Forward (WF). This category is versatile and easy to use both for advanced users and beginners, so it’s the one we’ll concentrate on in our product recommendations. This line by Scientific Anglers doesn’t come cheap, but it’s possibly the highest quality all-purpose, floating weight-forward line we’ve come across. It’s built to be totally friction free, and with an aggressive weight-forward style that lead to long, smooth casts, and a very precise, light presentation. It’s also designed with a unique texture that allows it to float well, and makes it durable and wear-resistant. This specific model comes in 3-9wt versions, all of which are built to be 0.5wt heavier for quicker loading of fast-action rods. If you’re interested in a floating weight-forward line like the Sharkskin, but looking for something more affordable, this offering by Piscifun is a great alternative. It’s designed to be extremely versatile, and usable both by seasoned veterans and novice anglers alike, with a heavy-weight head that's longer than the industry standard, allowing longer casts, but maintaining the smoothness of the action. It’s also built with a braided core that helps increase its sensitivity, and decrease line memory for a long-lasting line that’s very quick to respond when bitten, and allows for great line-feel. It also incorporates a front-welded loop for easy leader attachment, which is very useful when switching out leaders for different fishing applications. 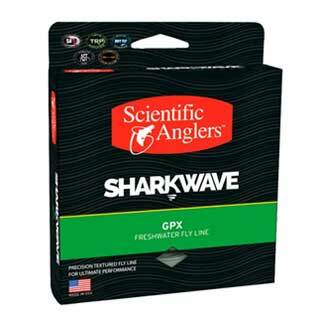 This line by Scientific Anglers is great if you like the Sharkskin, but are looking for a less aggressive, design that still floats beautifully. The taper on this line, unlike the sharkskin, begins much earlier, giving it a smooth presentation and long cast distances while still remaining lightweight, and being a bit less aggressive than comparable WF-floating lines. 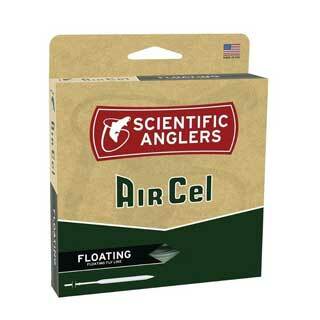 It’s built around a braided core that’s strong, durable, and very sensitive, and it has a great flotation. In addition, it incorporates some useful quality-of-life features, such as a raised bump on the handling section which indicates the best place to begin your cast, and a welded front-loop for easy leader attachment. If you’re looking for a durable, high quality mid-length head, weight forward line with excellent flotation, this is the line for you. 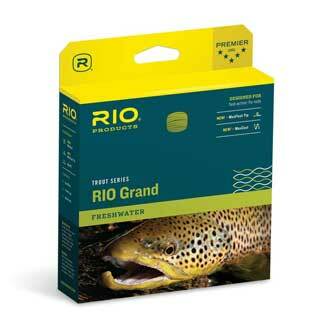 This Weight Forward Floating line by RIO Grand is built specifically for faster rod applications, and loads your rod quickly, erupting out of the guides smoothly and for incredible distance. An aggressive weight-forward profile helps with this – weight is fully concentrated on the front of the line with a high taper, giving you all the power you need for quick, long casts and easy retrieval. It’s also built to be a half-weight heavier than other comparable lines, which also aids in the loading of the rod. This line incorporates welded front and back loops, making changing backing and changing leads easy and quick. The line is high quality, it’s inexpensive, and it delivers explosive casting action that’s a treat to handle, and perfect when you need max distance. While most fly lines are okay in saltwater, they tend to break down more quickly, and deliver less satisfying results. 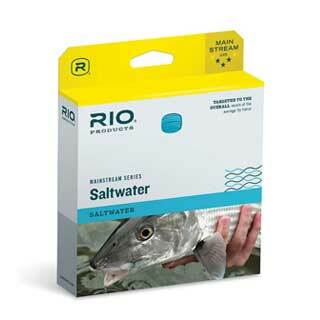 For this reason, saltwater anglers prefer saltwater-specific choices like this line from RIO, which is a floating, weight-forward model. It’s built specifically to resist the tough conditions of saltwater fly fishing, with an anti-saltwater, hydrophobic coating that holds up in even the toughest conditions, and a medium-stiffness core that provides plenty of sensitivity and holds up in the heat and salt of tough fishing conditions. It’s a great all-around choice for your saltwater applications, with dependable durability, great casting action, and a gentle presentation despite its stiff, tough design. These choices, while not comprehensive, are a good sampling of common line styles, weights, and designs in use by anglers today. There are other styles out there – double taper, sinking line, etc – but they’re more often used in niche applications where an appropriate weight-forward floating line is perhaps not as specialized, but can still do the job. Check out our recommendations and our guide on line styles, and you’ll be able to pick out the perfect product for your specific needs.